Laboratories are social spaces. They need to be designed and built in ways that encourage team-based research. 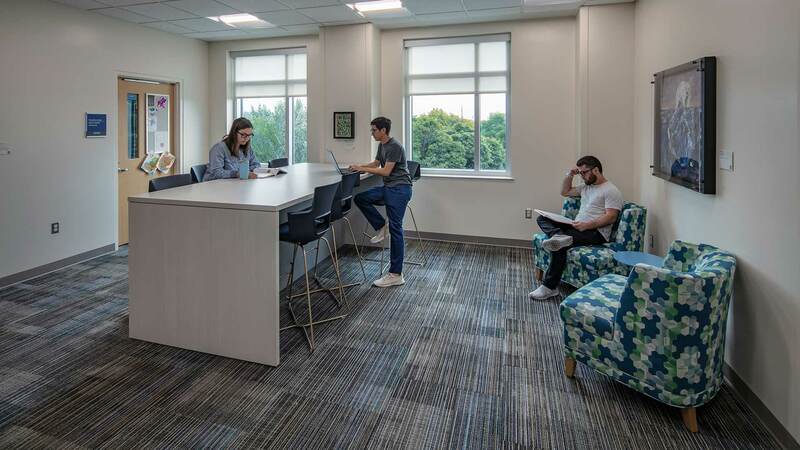 Over time, interdisciplinary collaboration has made way for cross-disciplinary collaboration, and modern labs reflect this in their design to accommodate different types of work within the same lab. At Rockford, we’re seeing that educational labs are rarely designed for one discipline, instead supporting interdisciplinary studies. This is not always the case; however, the trend is toward more collaborative areas and less private space. Current labs tend to be large and open with few walls, with small conference areas nearby to foster quick collaboration. This collaborative approach to scientific research extends beyond traditional departments. Partnerships between Universities, healthcare systems, and broader research entities involved in public policy, business, economics, and private industry are also shaping today’s labs. A result of growing partnerships, new laboratories are often being slated for urban environments near universities, hospital systems, technology companies, and related organizations. These areas, often referred to as “innovation districts,” create opportunities to spark innovative thinking by bringing together different people and ideas. They offer greater diversity and generate stimulating environments populated by thought leaders – key components for attracting and retaining the best and brightest recruits. 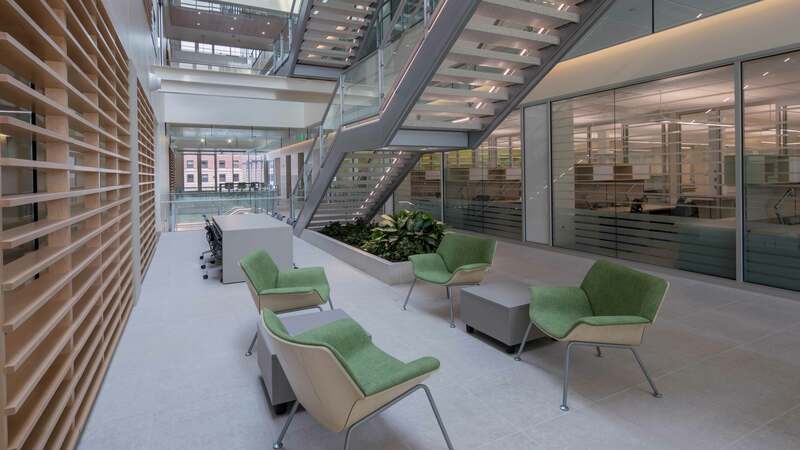 As labs focus on retention and recruitment, we see clients value clean, modern spaces – similar to the changing workplace – with natural light and comfortable gathering spaces. Like mobile workspaces, designated desks and lab bench seats are no longer the norm for modern lab spaces. Virtual spaces and technology allow researchers to communicate with others regardless of location. Though we still see conference rooms as dedicated meeting spaces, virtual meetings often occur outside of these rooms by laptop or smartphone. Partnerships between Universities, healthcare systems, and broader research entities involved in public policy, business, economics, and private industry are also shaping today’s labs. Science is a field of continual growth and rapid change, so labs need to be built with adaptation in mind. Successful spaces are flexible – those that respond to present needs and can accommodate future demands. Removable partitions and interchangeable ceiling utility systems can all make adapting space easier. Wet lab spaces should feature movable benches with overhead service connectors for quick reconfigurations and with much research being conducted on computers, researchers’ offices can serve as additional dry lab space. In successful labs, adaptability is also applied to the mechanical and electrical (M&E) systems to reduce energy use and increase efficiency gains. Trends lean toward the most recent advances in energy-efficient equipment and solutions for research facilities, like room-temperature storage, chilled beams, and lab sensors. Chilled beams, for example, can be a replacement for common air systems. The beams can heat and cool spaces comfortably while requiring less space and overall cost (both to construct and operate). In addition, flexible M&E hook-ups can accommodate large equipment without the need for renovations. In our experience planning, designing, engineering, and constructing research facilities is most successful when the clients’ goals and requirements lead, with trends helping to inform the conversations.